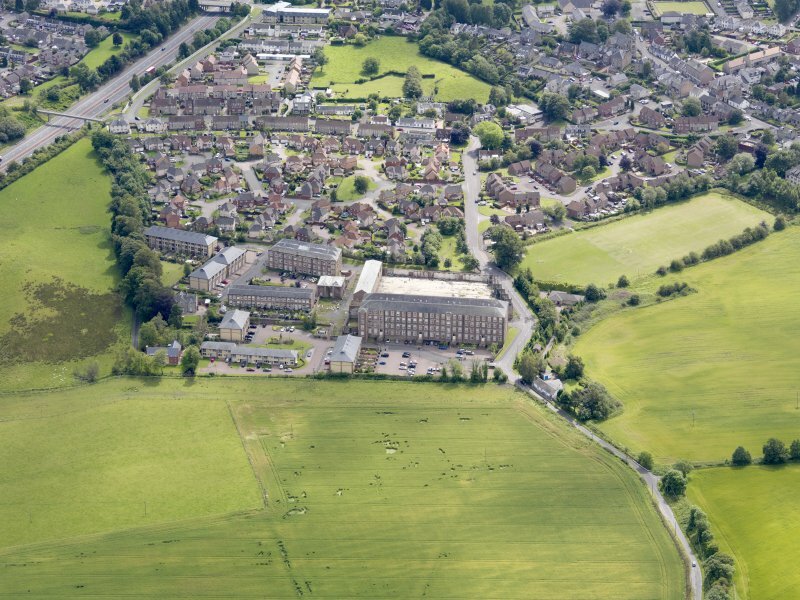 Digital image of an elevated general view of mills from SW.
Oblique aerial view of Hayford Mills, taken from the S.
General oblique aerial view of Hayford Mills, taken from the NW. (Location cited as NS 776 928). Hayford Mills, founded c. 1860 by Messrs Smith. A very interesting group of buildings, mainly red and white brick. The main block is 5 storeys high, 6- by 25-bay, and there is a striking 3-storey, 6- by 12-bay building with round-headed windows in the top floor, segmental-headed in the second floor, and flat-headed on the ground floor. There is a key-pattern motif below the dentilated cornice. The other sizeable structure is 2-storey, 2- by 24-bay, with round-headed windows in the upper floor. The complex is completed by a range of single-storey rubble weaving sheds and some minor ancillary buildings. There is a tall circular-section brick chimney. Now warehouses. Woollen mill complex originally established in 1833, though the present buildings date to the 1860-1880 enlargement initiated by Robert Smith Jnr. 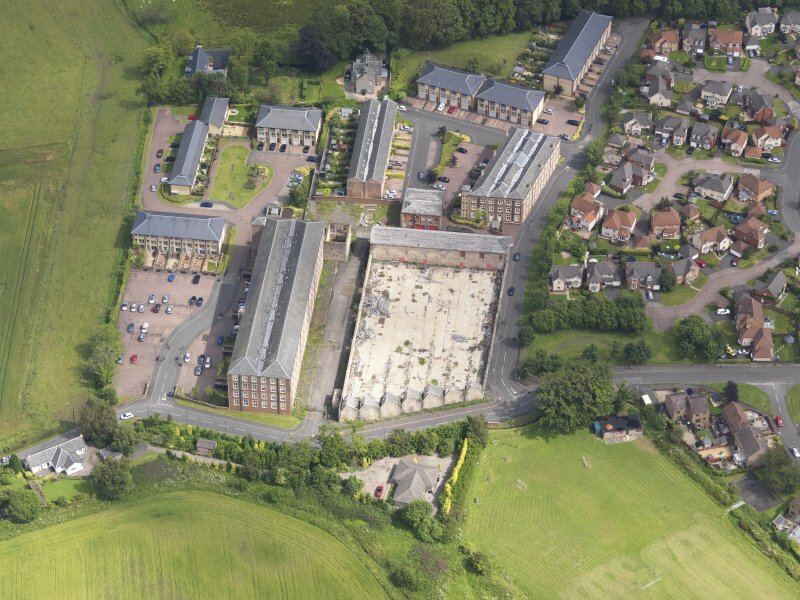 The complex remains one of the largest and most complete examples of a vertically integrated woollen mill in Scotland. Block B4 is the former Engine House to the Mule Spinning Mill, a high single storey structure part built in rubble and polychromatic brick between 1865 and 1871. The roof is piended, slated, and M-shaped, whilst 3 tall arcaded windows sit over the door. The interior retains an elaborately boarded and panelled ceiling with ornate ventilators.